Of course, they’re already talking about the erstwhile promise of the Donald’s Trade War truce, the silence from Beijing, and the potential loss of leverage with regard to China. But there’s this too: Toll Brothers slumps most since May after home orders plunge. And consider: Dollar drops as U.S. Treasury yield curve inversion sparks recession fears. These are signs the second-longest recovery on record is coming to an end. Will it come in 2019 or 2020? Will it be broad based, or will it be limited to the housing sector? Will the broader economy withstand recession-like weakness in that particular sector? These are also signs the Christmas Eve Tax Cut of 2017 is one more trumped-up mirage. It is not the “biggest tax cut in history.” Nor will it “stimulate” any kind of meaningful Main Street growth. 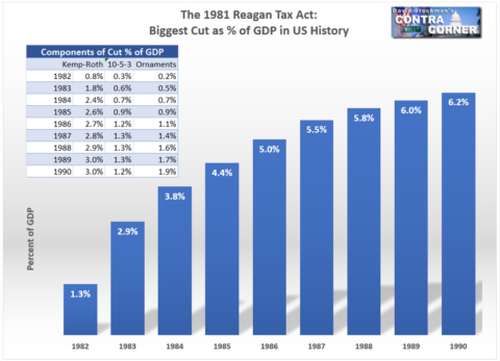 When the “bidding war” with the Democrats ended in July 1981, the U.S. Congress had cut the federal revenue base by 6.2% of gross domestic product (GDP) in the out-years. In 2018 terms, that’s a tax cut of about $1.2 trillion per year. By contrast, the “peak year” cut (fiscal 2019, which started October 1, 2018) in the Christmas Eve Tax Cut of 2017 is just $280 billion. That’s just 1.3% of GDP. Debunking this “mine is bigger than yours” boast illuminates why the “growth” boom claimed for the current bill is so preposterous. Indeed, the Christmas Eve Tax Cut of 2017 is, to my knowledge, the weirdest large-scale revenue bill ever enacted. It’s drastically front-loaded, and then it shrivels out of sight after the middle of the decade. When all is said and done, it’s probably anti-growth. On one hand, it amounts to a temporary abatement – a gift to the middle class that will eventually turn into a fiscal nightmare. On the other hand, it’s a permanent cut of the corporate rate that, so far, has done nothing for Main Street. This “disappearing tax cut” pattern is an effort to “game” the budget-making process. It was also about delivering the maximum wallop of goodies by Election Day in November 2018. Of course, Wall Street and Corporate America enjoy the fruits of a permanent 21% corporate rate. For the middle class and Main Street, it’s just Lucy pulling the football away from Charlie Brown… again. And I can’t figure out what kind of economic reason supports it. Set aside “bigness.” It’s certainly no supply-side theory that embraces raising the tax burden on the U.S. economy from 16.6% of GDP in fiscal 2019, the “peak year” cut, to 18.5% of GDP in 2027, after the net impact turns positive. After all, that’s a 13% increase in the total federal tax burden. Accordingly, it doesn’t incentivize a permanent increase in supply-side resources at all. It’s just a one-time pull-forward of economic activity – per the patented Keynesian “stimulus” illusion. In fact, the steady uphill march of the federal tax burden can only be described as some kind of Trumpian throwback to the primitive “pump-priming” theory of the 1930s. And that relic is so tattered and discredited that even modern Keynesians no longer talk about it. 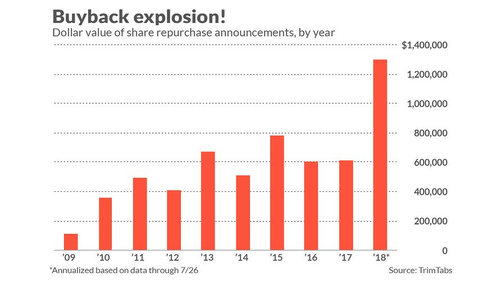 In the interim, of course, the Christmas Eve Tax Cut of 2017 did enable Corporate America to pump trillions back onto Wall Street via stock buybacks, higher dividends, and M&A deals. As we talked about yesterday, there’s little substance to this 90-day cease-fire between the Tweeter-in-Chief and the Chinese president. Indeed, it turns out to be a case of he said, Xi said. Not even Wall Street bought it. Yesterday’s weak “Trade War relief rally” fizzled into the close and gave way to a 600-point slide for the Dow Jones Industrial Average through lunchtime today. New tariffs will have an inflationary effect, and that’ll keep the Federal Reserve on its “normalization” path. That’s just one way the Donald is working against himself here.